Tennis is a type of racket sport with the object of focus is a bouncy ball. Usually, it is played in a lawn with markings to signify the boundaries of the court. Two individual or pair of athletes are separated by a net that compete against each other. This sport features a lot of sweat, exposure to sunlight, and a great chance for impact. Tennis is a specific sport. It does not differ in setting or condition. It could be done in singles or doubles. Nonetheless, the equipment, court, and rules still apply. Because tennis as a sport is already defined, there are not much variations in the glasses available in the market. The only factors that could be changed are the style of the frame and the color of the lenses. Yet, it is safe to say that tennis glasses can’t be categorized into different types. Tennis glasses have frames that are ready to absorb shock or impact. The material made for these frames evenly distributes the impact from the object hitting the glasses. In materials engineering, the three types of material are metal, polymers, and ceramics. Metals are generally hard in character and offers great strength. However, glasses with metal frames are heavy. Ceramics, unfortunately, are generally brittle. Polymers are generally flexible and lightweight. Polymers are made of multiple chains or groups of molecules. The matrix of these groups of molecules introduce intermolecular forces that keeps these groups together. A mechanical breakage could only occur in interstitial spaces and not strong enough to break a molecule bond. Thus, if the chains or groups of molecules are situated in only one direction, and an object comes at a perpendicular motion, the resulting force is then distributed along the frame. Reinforcement could also be added to optimize the positive qualities of polymer as a material. The lenses could also be made of the same material as the frame for impact-resistance. For lenses, it is close to impossible to have metal. The basic materials for the lenses are ceramics and polymers. Ceramics (glass material) display the optimal optical quality but could be dangerous for an impact-prone sport. The glass material is brittle and could produce shards that may harm the eyes. Plastics are less likely to shatter. Optical quality is not significantly compromised. Tints are coated on the surface of the lenses. Light hitting the surface of the lenses have specific wavelengths reflected off the surface, giving rise to the color perceived by the naked eye. Polarization uses a filter that permits light of specific orientation to pass through. With these two techniques, the amount of light passing through the medium is greatly reduced. In addition, there are also filters that does not allow certain wavelengths of light that are different from the visible light range. These wavelengths of light include ultraviolet (UV). In the spectrum, UV could be found at the left of the visible light. UV light travels at shorter wavelengths and has higher frequencies. Thus, UV light possesses higher energies that could do harm to the eyes. The lenses could be multicoated to acquire all the features that could bring protection to the eyes. For impact-prone sports such as tennis, the most important feature of the lenses and the frames is their resistance to impact. Polymers such as polycarbonates pass for a great impact-resistant material. In the user’s part, rubber nose pads and ear grips could lessen the effect of impact. There is an existing hydrophilic rubber in the market which adheres to the skin more when wet; that is, when the user perspires, as such in the case of an athlete who moves a lot and is exposed in great heat. The frame should have a snug fit but not too tight that it pressures the temples. Loose frames could be adjusted by a strap that could be readily bought and installed on the eyewear. There should be enough space at the T-zone of the face, so the air could circulate freely. Thus, fogging of the glasses could be prevented. The style of the lenses shall serve the athlete advantageously. The most promising style for tennis glasses is the shield or wraparound. Not only do they serve the greatest protection, but single lenses provide a large panoramic vision which is important to the playing field. All coatings and modifications could provide positive benefits to the user. The most recommended color for the tint of the lenses is amber for it enhances contrast of the yellow ball versus the green lawn. Gradient lenses are not recommended. It is important that the vision of the user will be focused. Damage, injury, or prolonged harmful effects to the eyes could be reduced by wearing proper tennis glasses. Ordinary sunglasses that do not fit for playing tennis could shatter when the ball hits the eyewear at high velocity. The shards produced could cut the user’s eye. Uncoated lenses could expose the user to much harmful rays that could cause blindness, macular degeneration, eye cancer, different forms of cataracts, and many more. Improper eyewear could also distract the user from playing. 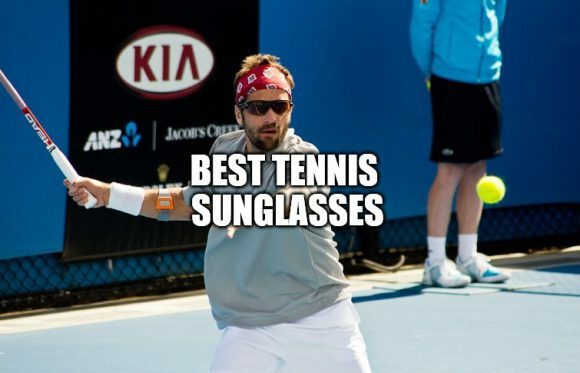 Here are some of the best tennis sunglasses that you can use. The arms of this eyewear are flexible and this makes them easy to fit on different head sizes. The nosepieces are made of silicone and do not have many ridges. This gives them a firm grip around your nose. The frame of RIVBOS (Rb831) is made up of Switzerland tr90 material. It is super light and has a stylish design. With this lightweight feature, the user enjoys the comfort of this sunglasses. The wraparound design that sits snugly and comfortably around the face ensures that they stay at all times. The wide temple design makes sure that the sunglasses is appealing and durable. The color enhances effective contrast and most appropriate for outdoor activities where the user is likely to experience difference in light change. Finally, the lenses protect the eyes from various harmful sets of rays mainly the ultraviolet (UV) rays. It is lightweight and has a stylish design making them look aesthetically pleasing on users. These glasses are long lasting and offer a stylish fashion feeling. Moreover, they have an adjustable toggle on cords to ensure that straps will not fall off easily. It is designed with a thin-frame design. Moreover, they have the lightweight polyester sunglasses retainers. The Ewin E01 polarized sports sunglasses frames are made with a scratch resistant material. Moreover the frames are unbreakable. They are provided with an inner frame for shortsighted lenses. So it is easy to carry and install. It protects the eyes perfectly. The main black lens is polarized against strong sunlight. The other 4 lenses are colored for different environmental condition. The Revo multicolor lens protects the eyes from the damage of ultraviolet and infrared. These are suitable for people who work in the condition of strong and bright light. This eyewear is made up of a bendable frame made of flexible composite material. So it will always return to its initial shape even after being bent. These frames are made of DU645 material that is one of the most durable and comfortable material for sunglasses frames. 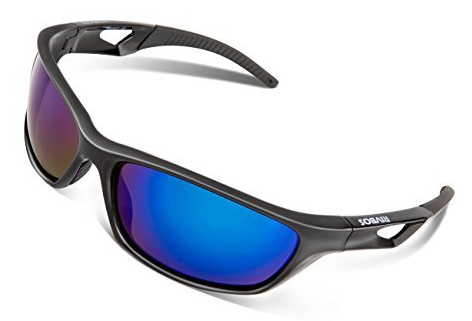 With the polarized sunglasses with cool sports design, this eyewear is practically efficient for both genders and any age. 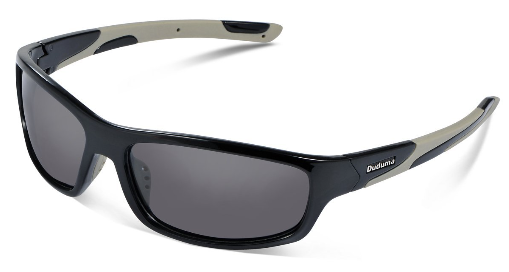 Unlike most eyewear that shares a common frame design, the Duduma Polarized sunglass are designed with a totally unique design making them stand out in the market and preferable to most users. Many people prefer a unique look especially for stylish looks. The wrap around design in this sunglasses helps in protecting the user’s eyes from every angle. This design covers the entire eyes making sure there is no chance of rays of light sun reaching the eyes. It filters out 99% of reflected glare without the haze and optical distortion that can come with polarized lenses made with conventional manufacturing techniques. The fact that these lenses are polarized they are capable of protecting the eyes from any form of scattered light or reflected light. In a nutshell, these lenses offers efficient and clear vision making it ideal for users who buy them for driving purposes. Basically the Duduma polarized sunglasses are the best eyewear designed for this purpose. This is because they are affordable, light and offers premium services. Moreover, they are durable and can last for a very long duration of time. The frame of this eyewear is made up of Switzerland tr90 material. It is super light and has a stylish design. This sunglasses is usually efficient and best for almost every outdoor activity. This is because they are designed with a light frame and durable frames. These sunglasses are provided with an anti-slip rubber nose pad. This prevents them from slipping of the face due to excessive sweating. Moreover, the nose pad gives them a unique beautiful look that most of the equivalent sunglasses lack. Elastic straps are used to ensure that the sunglasses are on their right point while undertaking the outdoor services. They are manufactured with premium polycarbonate material which restores the on-glare real world. The lenses also help to reduce eye fatigue and ensure premium eye safety in all kinds of outdoor activities. These sunglasses are also scratch resistant and impactful. 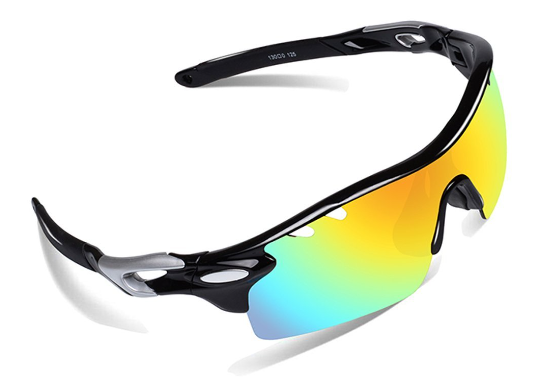 Tennis sunglasses are basically sports glasses specialized in impact-resistance. There is not much variety of tennis glasses in the market. 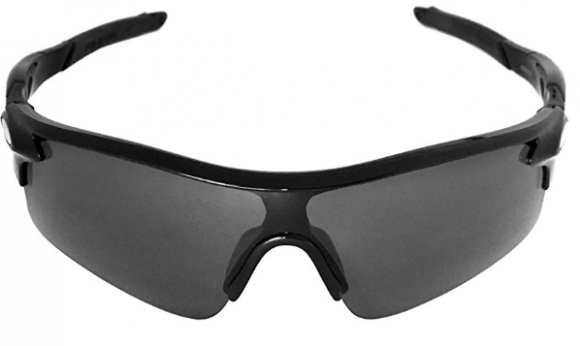 Having the proper material and features could make an ordinary eyewear fit for tennis. It just have to be impact-resistance, comfortable, and reduces glare and the harmful effects of radiation. Thanks for taking the time to write a great article about tennis sunglasses. I never thought about special kind of sunglasses to play tennis but your points make me realize how important they can be and how useful they are. Most of the times I use to think about sunglasses as a fashion point, but reading more from your website I see the importance they have to help us to perform better no matter what we all do in life. 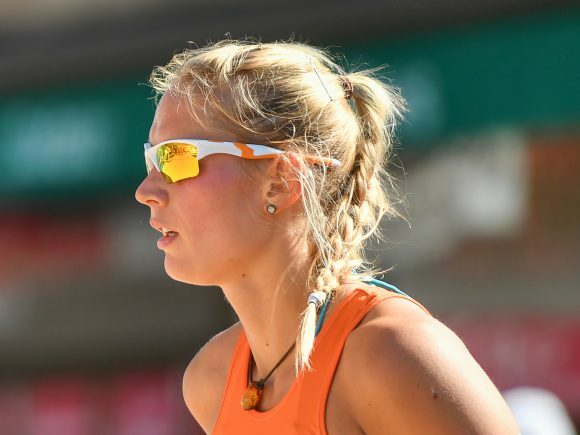 I will bookmark your article as Summer is coming and playing tennis is already on my to do list for this summer I’m sure I will need a pair of these sunglasses. I agree with you. Having sunglasses is important most especially that nowadays the rays of the sun is already detrimental for the eyes if exposed for a long period of time. Thank you so much for such an informative website about tennis sunglasses. I appreciate the explanations regarding material, U.V. filtering etc. I am out in the sun a lot and getting a pair of sunglasses that will stay on my face doing vigorous activity is very important to me. I know just where to come next time I am ready to buy a new pair. Sure no problem. Just let us know if you have more questions about these tennis sunglasses.